Have you ever wanted to live the pirate’s life? If hunting for treasure is something you’ve always wanted to try, but don’t want to get dirty in the process, or have little time on your hands, this game is just for you! Traveler’s Quest is a game which allows you to buy maps, track down virtual treasure in the real world and add it to your virtual collections. The maps are not just part of the game, they belong to other people around you who are also playing the game! That’s right, when you bury your treasures, they can be dug up by other players in the game who can then choose to rebury them or hold on to them in their treasure room! Traveler’s Quest is an awesome casual game that will have you checking for treasures wherever you go, near or far, first every once in a while, then when you wake up, and as you go to bed and any time in between! If you can get there, you can bury a treasure there, and dig one up too! There are no real life treasures to find and put back. The treasures are in game, giving you the ability to collect as many as you want and bury them anywhere. Map Room: Holds your treasure detector and maps to treasures you have detected or purchased from the in game store. Using the in game maps and GPS / location services, get as close as you can to a treasure before digging it up and get bonus gold for accuracy! Collect Treasure: Tap the “X” on the map to see treasure details pop up and tap “>” to collect! Treasure Room:Keep your collected treasures and maps to your buried treasures safely hidden in your very own treasure room! Buried treasures receive gold interest for each day that a treasure remains safely buried. Collections: Find every piece in a collection, and receive an extra bonus, plus an achievement! Make sure to keep a spare in your treasure room (unburied) so you keep your completed collection bonus, and your place on the collections leaderboard! Some collections, or pieces of collections can only be found in limited areas around the world too! In Game Store: Use your earned gold for level upgrades and traps. Use your purchased doubloons, gold, or use an in-app purchase for über detect, enhanced news, bury and hunt radiuses, ships and more! Ships: Captain your own ship, or join another ship to keep your shipmates from seeing your buried treasures, and to band your scores together on the Ship Leaderboards. Doubloons awarded weekly for the best scoring ships on the sea! *Ships upgrade required to captain or join another ship. In Game Leaderboards: Travelers Quest boasts in-game leader boards based on over all score, gold, treasures, collections and now accuracy. Fight your way to the top by pillaging your friends buried treasures then taunt them in the enhanced news feed which lets them know who stole their treasure! Compare your achievements and scores with your friends, and the world! News Room: News updates show who has purchased a map to your treasure and how much you earned. News also shows who has pilfered your treasure. Enhanced news upgrade shows you even more information about your maps and treasures others have found including the location and the treasure’s level. World Wide: Play against other players around the corner, or around the world, with players on every continent. Traveler’s Quest will get you off the couch and out of the house, hunting for treasures near by and far away. It’s the perfect game to play while you’re on the go! Around town or around the world, Traveler’s Quest is sure to be a game you come back to play! 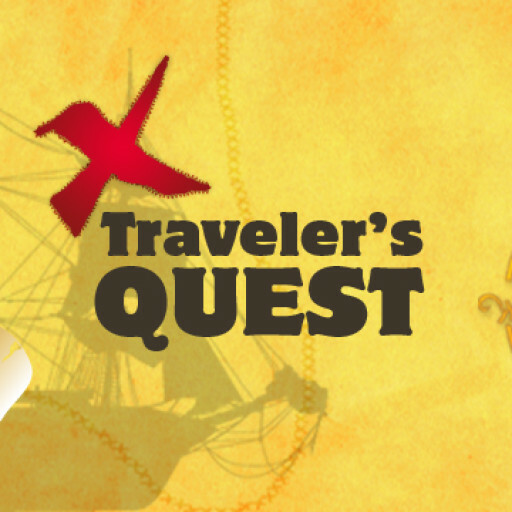 Become the richest collector in the world, in Traveler’s Quest!